WARSAW, Poland (CNN) -- The United States and Poland on Wednesday signed an agreement to base U.S. ballistic missile interceptors in Poland, a move that angered Russia. 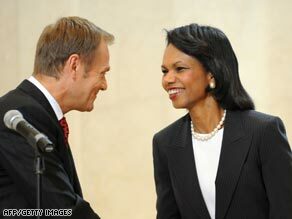 Polish Prime Minister Donald Tusk and U.S. Secretary of State Condoleezza Rice. Polish Foreign Minister Radek Sikorski and U.S. Secretary of State Condoleezza Rice signed the deal and hailed it as a breakthrough in international cooperation. They said the missiles would be used only for defense. "It will help both the [NATO] alliance and Poland and the United States respond to the coming threats," Rice said. "Missile defense, of course, is aimed at no one. It is in our defense that we do this." Moscow says the missile-defense system is aimed at blunting Russia's nuclear deterrent. It has warned the deal could open Poland to attack. Rice called Russia's remarks "pathetic," the same term used by NATO Secretary-General Jaap de Hoop Scheffer a day earlier to describe the threats. She vowed that Poland's NATO allies will come to its defense. She said Wednesday that Russia's aggression toward Europe has been going on for a while, with Georgia the latest example. Russian troops remain inside Georgia -- after fighting that flared nearly two weeks ago --despite a cease-fire agreement that included a pledge to withdraw. Although it pushed for the missile system, Poland had made demands that had stalled negotiations. The pace of the talks accelerated, however, after Russia invaded Georgia in the dispute over South Ossetia, a region that broke away from Georgia. Polish Prime Minister Donald Tusk said the missile system strengthens the two countries' strategic partnership and improves security. The countries will negotiate a separate agreement for the status of U.S. forces in Poland to support the system, the declaration says. The United States will also provide training to Poland and provide real-time information about missiles tracked by a radar array in the Czech Republic. Tusk said the Patriot battery and U.S. installation are a "practical and measurable element of this breakthrough" agreement. "Missile defenses, including an interceptor base in Poland, provide a necessary and critical capability that can be used to defend both nations and other NATO allies from long-range missile threats" launched from the Middle East, the declaration says. The system will be linked to other missile defense facilities in Europe and the United States, the declaration says. Without referring to Russia, the declaration notes that the U.S.-Poland relationship is governed by the NATO charter "which provides that an armed attack against one NATO country shall be considered an armed attack against them all." Speaking of the cease-fire between Georgia and Moscow, Rice said that Russian President Dmitry Medvedev is not keeping his word and is ignoring international demands to get out of Georgia. Russia's intervention has strained Washington's relations with Moscow, Rice said. She said she doesn't foresee any meetings of the G-8, in which Russia is a member, or NATO-Russia council anytime soon. The United States will help Poland modernize its armed forces as part of the deal. The two countries also agreed to deepen cooperation on political-military issues, information-sharing and defense technology research and development.